Build the power and foundation you need to transition between poses. Dive into the fundamentals of asana at Yoga Journal LIVE! Colorado on the uniquely curated Beginners Path with Rina Jakubowicz. Register now to join us in Colorado Sept 27–Oct 4, 2015. Plank is a truly foundational pose. It teaches you to hold yourself together—like a sturdy wooden plank—giving you the power you need for complex poses and the grace to glide with ease through transitions between poses. Plank will build your abdominal strength; you might even find yourself shaking as you practice it. It can strengthen your arms and keep your wrists supple and healthy. If you practice this pose, over time your upper back and neck posture will improve, and you&apos;ll create support for your lower back as you learn to engage your abdominals. But in order to experience these benefits, it&apos;s important to work toward creating a well-aligned Plank Pose. To get there, use the yogic tool of self-inquiry. Assess your habitual postural patterns in daily life and begin to notice how they affect you in Plank. By becoming aware of patterns that aren&apos;t beneficial, you can apply the appropriate alignment principles to help change those patterns. Generally, people stand and sit in one of two ways. One way is to collapse the chest, round the shoulders, and allow the head to droop forward and down. The other tendency is to jut the ribs forward, press the chest open and shoulders back, and lift the head forward and up. To explore your own patterns, sit on the front edge of a chair with your arms by your sides. Let your chest collapse and your shoulders round forward. Then do the opposite: Squeeze your shoulder blades together until your chest pops open. Which one feels more familiar? A well-aligned Plank Pose will strike a balance between the two extremes. If you tend to collapse your chest and round your shoulders forward, then try to pull your shoulder blades down and in toward each other and draw your head in line with your shoulders. If you have the opposite problem, then try to create more abdominal support in the pose by moving the bottom front ribs back. When you find true alignment in Plank, you create a long line of energy from the top of your head through your hips to your heels. Your strongly engaged thighs and abdominals support your lower back, while your relaxed shoulders and open chest free your neck. Rather than sagging from your arms and feet, you stabilize your middle section. You&apos;ll feel strong, but also light and graceful. By practicing Plank with an awareness of your unconscious patterns, you can create change in your yoga and in your life. Start with a pose, then your posture, then anything else you can imagine! For a stronger Plank, imagine you are a dancer being lifted lightly into the air by your partner. If you don&apos;t engage all your muscles, you&apos;ll become dead weight and your partner will struggle to hold your limp body. It&apos;s the same in Plank: If you sag from your arms, the pose is a struggle. Instead, engage your core, and you&apos;ll be able to hold the pose with lightness and grace. Step 1: Cultivate a range of movement in your upper back and shoulders. 2. Line up your shoulders directly over your hands and your hips directly over your knees. 3. Inhale as you extend your spine, lifting the head and tailbone and stretching your front body. 4. Exhale as you round your spine, tucking your head and tail under and lifting your belly. 5. Repeat these movements back and forth a few times. Now practice keeping your hips and lower back stable while you open the chest. Begin by lifting your bottom front ribs and your lower belly toward the ceiling. This brings your pelvis and lower back into the stable position that&apos;s necessary for Plank. Keep your lower back and abdominals fixed; then inhale as you lift your head, open your chest, and pull the shoulder blades toward each other. As you exhale, round just your upper back, spreading your shoulder blades apart. Continue this sequence while following your breath, keeping your lower back and hips stable while exaggerating the movement in your upper back. Keep your arms straight and maintain a steady pressure down through your hands and fingers. On the next inhalation, hold your position with your chest fully expanded, and keep breathing. Keep lifting your belly up and in to hold your lower back and pelvis still. On an exhalation, push your hands down and lift your upper back again, spreading your shoulder blades until you find a long, balanced spine. Rest in Balasana (Child&apos;s Pose) for several breaths. 2. Step your knees back, one at a time, about a foot. 3. Lower your hips and lengthen through the crown of your head. 4. Press the tops of your thighs up while lengthening your tailbone down toward your knees. 5. Keep your hands directly under your shoulders. Notice how, with more weight in your arms, your body might start to sag, putting a sway in your back. Engage your core to support your back: Lift your belly and pull in your lower ribs. Stay aware of your shoulder blades, drawing them down and in. Work your legs strongly, pressing the tops of your thighs up; at the same time, keep stretching your tailbone down toward the backs of your knees. Extend the top of your sternum forward as if it could reach through the crown of your head. Exhaling, feel that one long line extends from your sternum through your tailbone toward the backs of your knees. Hold for another full breath, building your strength. Rest in Child&apos;s Pose. 1. Start on all fours, with your wrists under your shoulders and wrist creases parallel to the front edge of your mat. 2. Step one leg straight back, grounding all the toes; then step the other leg back. 3. Reach your heels back and firm the legs. Lift your kneecaps and press the tops of your thighs up. Reach your tailbone back. 4. Push your hands and all of your fingers steadily and evenly into your mat and straighten your arms. Pull your shoulders down away from your ears, lengthening your neck. Explore your shoulder and chest alignment. First, push your hands vigorously down and round your upper back. Then, draw your shoulder blades down your back and gently toward each other. Feel your breath move into your chest as it expands. Press your thighbones up and lengthen your tailbone back toward your heels, engaging your lower abdominals. Now, try to get longer. Reach the top of your sternum and the crown of your head forward toward the wall in front of you. Hold for several breaths, letting your awareness grow and a sense of power suffuse your whole being. Press back into Downward-Facing Dog Pose, or rest in Child&apos;s Pose for several breaths. If your wrists are tight or tender, try rotating your hands slightly outward. Or, try cupping your hands, holding your weight on your fingertips. Protect your elbows from hyperextending by pressing your inner upper arms away from each other until your biceps muscles are engaged. Bring the pelvis into alignment by pressing the tops of your thighs upward, while lengthening your tailbone back to the wall behind you. Don&apos;t forget your feet. Ground down through all 10 toes evenly and press the center of your heels straight back to the wall behind you. If your neck is strained, lengthen it by lifting the back of your head toward the ceiling until your ears line up with your shoulders. Samskara is a Sanskrit word that means "subliminal impressions"; it&apos;s the idea that we have learned unconscious patterns of behavior that show up in our bodies and our lives. 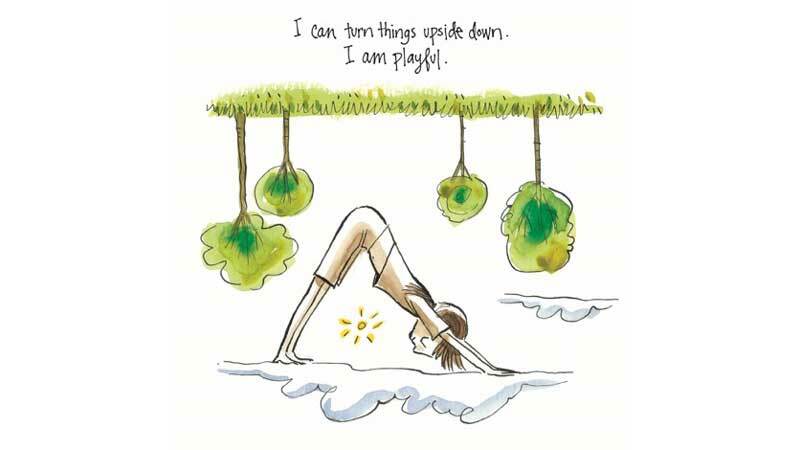 Yoga teaches that noticing your habits is the first step toward change. In your practice, it&apos;s easy to observe pockets of tension in your body and consciously relax them. Later, you can use your new awareness off the mat to release tight muscles (and the thoughts or emotions that trigger them). Seeing and letting go of unhelpful physical and mental samskaras is a means of changing your habits. Watch a video demonstration of the pose. Annie Carpenter teaches yoga classes and leads teacher trainings at the Exhale Center for Sacred Movement in Venice, California.